According to the Washington Post, there are close to 13,000 registered federal lobbyists promoting special interests in Washington, DC. Of the 13,000 none work directly for the ASA. The ASA, as a non-profit, scientific organization falls into a Internal Revenue Service tax status (501c3), which limits the amount of lobbying (or direct advocacy) we can do. Moreover, historically, ASA Council has taken a cautious approach to direct advocacy. 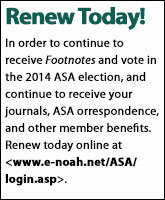 So if ASA as a scientific society can’t give money, loiter in the halls of Congress, support political campaigns, and other direct advocacy methods, what can the ASA do to protect and advance sociology at the federal level where research funding and science policy directly affect individual sociologists and the discipline? The ASA can use more indirect, methods to advance sociology in Washington, DC (e.g., sponsoring Capitol Hill briefings or National Academies of Science studies, participating in poster sessions on Capitol Hill, and serving in leading roles in various coalitions). These indirect methods can play an important role in educating members of Congress and their key staff about the ways sociology contributes to the public good. But on major issues—such as appropriations bills and attacks on the National Science Foundation—these means of advocacy only create a squeak that can be lost among the cacophony generated in Washington, DC, by these 13,000 federal lobbyists. So over the past few years I have asked staff to see what more ASA can do to make our voice louder within the constraints of our tax status and organizational history when that is absolutely necessary. One of the first things we did was to reinvigorate our media engagement. This was a suggestion from Council. If we cannot directly inform Congress about the importance of sociological research to our society, then the media and popular culture can. Since 2011, the ASA has distributed 170 press releases on sociological research, established an ASA Experts Database for the media, and logged close to 2,000 media interactions. This has generated a consistent flow of strong and interesting sociological studies in the major media outlets and the discussion of sociological research on popular TV shows like The View, The Talk, Conan O’Brien, Today, and CBS This Morning. The press releases that we distribute focus on issues that are relevant to current and future policymakers (see www.asanet.org/press/press.cfm). Second, ASA staff has worked to build our social media presence. Our current president, Annette Lareau, has been particularly active in moving us forward. ASA’s Facebook and Twitter (@ASAnews) followers include ASA members as well as journalists and policymakers. Through social media The ASA is able to share news and information on sociological research, respond to requests from the media and policy makers, and build a network of like-minded individuals. We encourage members to promote their research on social media. If you are on Twitter, consider using the hashtag #socresearch to promote your research. In San Francisco this August ASA will sponsor a major effort to train Annual Meeting attendees in these tools. Third, for well over a year, ASA staff has worked behind the scenes to build a grassroots communication program within the Consortium of Social Science Associations (COSSA). The platform allows COSSA members to communicate with elected officials, Executive Branch officials, and other policymakers through e-mail. With this tool, “calls to action” can be drafted by COSSA and sent to the social science community for immediate response. While other organizations have used similar tools, this is the first time the social sciences can speak to policy makers—strategically and in one voice. The new COSSA Executive Director, Wendy Naus, has led this new COSSA effort. The grassroots communication platform was launched in March (see the March Vantage Point) and has led to the House of Representatives hearing a loud “No!” with regard to the FIRST Act, which seeks to significantly reduce NSF social science funding. ASA members were asked to send letters to their members of Congress through this communication program and you did! More than 100 letters were sent after ASA members received March’s Member News and Notes, more than 650 letters were sent in response to my March 27 e-mail request, and 152 letters were sent following ASA Facebook and Twitter links. COSSA and ASA will continue to send “calls to action” when pressing issues arise. We will not pester you; this is a collective action tool for those times when it a response from sociologists is urgent. COSSA’s FIRST At current call to action can be found at cqrcengage.com/cossa/home. With these reinvigorated and new tools sociology’s voice has become stronger and will continue to gain strength. While I work with Executive Office staff and Council to find new ways to communicate the value of sociological research, I am now asking each of you, as an ASA member and sociologist, to become a vocal champion of the discipline. Please consider some of the ways in which you can communicate your research and passion for the discipline. And recognize that raising the public’s appreciation for sociology at the local level as well as in the national media makes it harder for policymakers to enact legislation and regulations that negatively affect the future of our discipline. Inspire future scientists by sponsoring (or judging) science fairs, demonstrate sociological research methods and techniques during “hands-on” science displays, or become a resource for a local school. Present your research at local groups/clubs, and volunteer with community organizations that could use your expertise. Or organize a science café. Make sure your research is promoted by your college or university’s public information office. Write local op-eds. Talk to your lawmakers in a formal or informal settings. Participate in the ASA Annual Meeting special training events on social media in San Francisco. Become a vocal champion for sociology. You are essential to our success. Sally T. Hillsman is the Executive Officer of ASA. She can be reached by email at executive.office@asanet.org.